I am still reading, denizens. I don’t have nearly the same amount of time I used to have for one of my favorite pastimes, but I scrape together what time I can and make the most of it. I’ve also been working my way through a large series of novels, which I decided to review all together rather than separately. Sneak preview on that? It’s going to be a highly positive review. In the interim, however, I recently found myself spending a significant amount of time stationary. I love flying for many reasons, one of which is the fact that I literally have nothing more pressing to do with my time than read and cat nap. 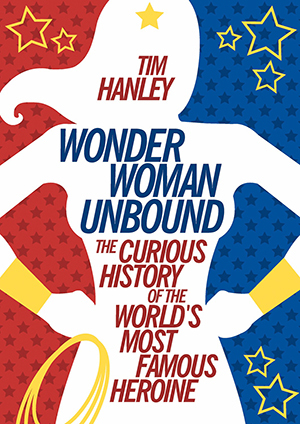 In between copious open-mouthed snoring sessions (yeah, I’m that passenger) I made my way through Tim Hanley’s Wonder Woman Unbound: The Curious History of the World’s Most Famous Heroine. I learned of Hanley’s book through an Amazon recommendation a few weeks after I purchased another recently released book on Wonder Woman’s history (a book sitting patiently next to my night stand). Amazon wanted to offer me the Kindle version of Hanley’s book for something like five bucks at the time. Who can pass up such an offer? Clearly not me. I’m delighted that I couldn’t refuse this offer. Curious history, indeed! I already knew a great deal about how Wonder Woman came into existence. Even a passing knowledge makes for fascinating conversation. However, Hanley goes much deeper than cursory facts and provides a compelling examination of Wonder Woman’s debut and her evolution through the Golden, Silver, Bronze, and Modern Age (the book released in 2014, so it’s a relatively holistic history, to be sure). I honestly wish I had read the other Wonder Woman book first, to be able to answer the question of is this book worth reading if you’ve already read the larger recent publication. I can’t, unfortunately, answer that question. However, regardless of which provides the most information, I can state emphatically that this book is a marvelous resource for all things pertaining to Princess Diana of Paradise Island (she didn’t come from Themyscira until the late 1980s). Wonder Woman is quite the curious creation, her impact resonating with generations of women who grew to embrace the character as one of the penultimate feminist icons (even as her male writers tried to rein her back “under control” during the 70s when real women had the audacity to expect things like equal rights), while mainstream comic fandom never really latched on to her with the same tenacity that those “other” DC Comics legends enjoy. Whereas Superman and Batman are stalwarts within the superhero pantheon, their stories replayed again and again with mind-numbing frequency, Wonder Woman skirts the perimeter (perhaps she should step out of the invisible jet so more people notice her? ), never really rooting herself into fandom mythology. We know of her, but we don’t know her. Maybe this upcoming movie will change all that. Maybe it will finally bring Wonder Woman the populist acclaim that she more than deserves after 75 years of mainly merely being Wonder Woman, the first major superheroine. Maybe. Whatever it brings, be it pleasure or pain, at least it won’t have Batman or Superman in it. That’s always a bonus. Final Verdict: Definitely saving this on my Kindle. It was a pleasure to read and definitely made me want to read that other book. Guess it’s time to move it closer to the top of my pile. Maybe it can even be next…after the series I’m reading at the moment.